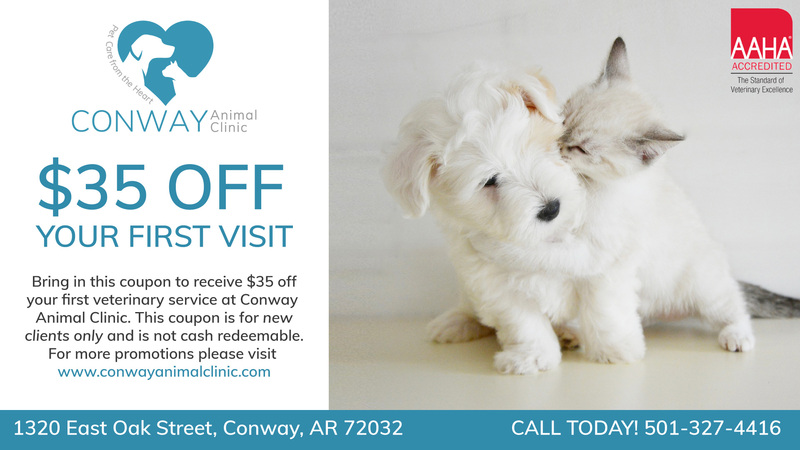 Conway Animal Clinic is proud to serve Conway, AR and the surrounding communities. We believe in providing the highest quality medical care while fostering a welcoming atmosphere. Conway Animal Clinic is the only AAHA accredited clinic located in Conway, Arkansas, and one of eleven in the state of Arkansas. Please take advantage of our New Client Offer! New clients may print and redeem this coupon for $35 off services on your first visit! We welcome all new clients to our veterinary facility. We invite you to contact us today, we would love to discuss your pet's care. If you have any questions or concerns, please call us at 501-327-4416. Take a look at the people and animals of Conway Animal Clinic in this video tour. Conway Animal Clinic Copyright © 2019.